Since I have felted my share of sweaters, I thought I would share my technique with you. This is what I have found works for me and the projects that I do. Where do I find the wool sweaters? I find my sweaters at thrift stores. My local Goodwill has a half price sale the first Saturday of every month. So that is when I shop for my sweaters. I live in the south so there is not an over abundance of wool sweaters. I have to hunt for them. Fortunately, I have become pretty good at spotting which ones are wool. My brother and his girlfriend are avid thrifters so they always keep me mind when they are shopping. (Thanks guys!) My family is nice enough to give me first dibs on any clothes they are getting rid of or donating too. What kind of wool sweater works best? I have found that 100% wool sweaters work the absolute best. In my experience, Old Navy and Gap sweaters felt up really nicely. Blends will work, but not as well. The thickness of the sweater will make a difference when felting. If you want a thinner material to work with, look for a thinner sweater and vice versa. If the sweater has a hole in it, the hole will not disappear with felting. Holes don't scare me though. If anything, they make me feel better about my purchase. I feel like I am truly rescuing the sweater from the landfill. How do I felt the wool sweaters? The first thing that I do is sort my sweaters by color. You don't want to wash a dark sweater with a light sweater. Once they are sorted, I put them in my washing machine and wash them using the hot cycle. I have found that most of the time I have to wash them a second time to really shrink them up. You will have some stray fuzzies that you will have to clean out of the washing machine so beware. After I am happy with the felting, I put them in the dryer and dry them on high. That's it. The sweaters should be nice and felted and you can use them for whatever your heart desires. I know some people air dry the sweaters and others cut the sweaters up first. It really just depends on what you are going to do with the sweater. I like to use the sleeves for my coffee cozies so I have found for me it works best to keep the sweater intact. Plus, I usually have no idea what I am going to do with the sweater until I do it. **Disclaimer-I am by no means an expert and do not claim that my way is the best or right way. 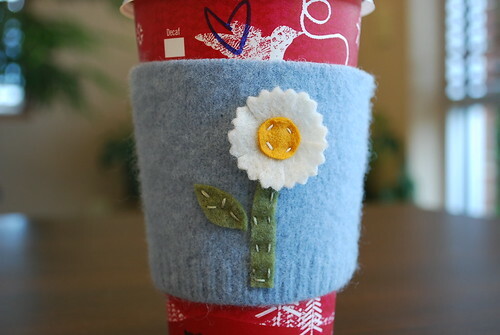 I did manage to post some more coffee cozies to my shop so go take a peek. That is so awesome that you found a way to create and make a little extra money. The look so fun, wish I has money to buy coffee outside the house to help support you..
Love it. Thanks for sharing the process, I'm n the hunt for some woolies now! I think I might find something to do with 'em. Do you use the felted wool for your appliques too - or just felt? Awesome! I had this idea that it's a really complicated process - but I think even I will have to give this a try!! I had no idea. Thanks for sharing!! Felting is sooo much fun. I'm waiting for my sewing desk to get put back together and off I will go on creating. You coffee cozy's are awesome. Great post. I have just found your blog, wonderful stuff!! I am interested in making cup holder and messenger bag, thank you for great instructions. PS, put your woollen garment/pieces in an old pillow case to agitate in the washing machine, protects the machine from potential problems. Thank you so much for sharing your knowledge.